Knicks star Kristaps Porzingis takes time away from his busy basketball schedule to discuss life off the court. Welcome to Anything But Basketball, an interview series that strives to bring readers a glimpse into the lives of NBA players away from the hardwood. When you're 7'3", basketball tends to be a way of life—but that doesn't mean it has to be everything. Since the NBA world was first introduced to Kristaps Porzingis, we've learned about his love of rap, his grandma, his childhood, his experience getting a driver's license, his dating advantages and more. With a personality as big as his physical frame, it's no wonder Knicks fans and Knicks haters alike have fallen in love with Porzingis. After making Knicks fans eat their boos with a sterling rookie season, Porzingis has run into more adversity in his sophomore campaign, battling injuries, losses and the Knicks' never–ending onslaught of drama. But not all has been lost for the future of the Knicks. He's raised his scoring average, added important elements to his game and took home the Skills Challenge title at All-Star Weekend. He's also had his mug plastered all over New York as Porzingis has become the new face of Delta Air Lines this season. He's now leading Delta's 'Fly Like A Pro' contest where fans can win a chance to fly first-class to a Knicks road game (coach is brutal when you're 7'3") next season. The Crossover caught up with Porzingis last week for a (silly) conversation about his off-the-court life this season. Matt Dollinger: I saw that you and Willy Hernangomez recently got your driver’s licenses and bought matching cars. How close do two people have to be to buy matching cars? 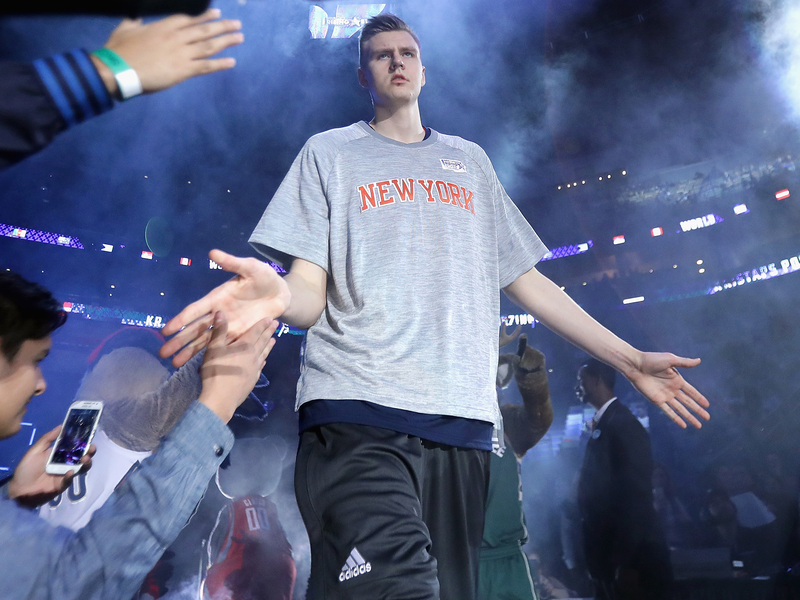 Kristaps Porzingis: They’re not matching! It’s the same car, but he has the C-Class and I have the S-Class. We both love Mercedes, they make great cars, but I was the first one to get mine. He tried mine out and fell in love. His car is also a little smaller than mine. MD: Speaking of fitting into small spaces, I see your Delta ads everywhere these days in New York. Being 7’3” and all, have you ever flown coach? KP: Of course, all the time! Before I got to the NBA I always flew coach—it was the worst time of my life. I remember being 14 or 15 and it was such a struggle to fit into those seats. Now I’m able to fly Business Class and get bigger seats. But the last time I flew coach was probably two summers ago. It wasn't fun. MD: Tell me you got the aisle. KP: Oh, always the aisle. MD: What do you do on team planes? Do you have a routine? KP: I usually watch League Pass or some Family Guy, try to relax and go to sleep. It’s tough to find time to get rest. MD: I’ve got more height-related questions, I apologize in advance. But do you still get ID’d at bars when you are 7’3”? Or do they kind of give you the benefit of the doubt? KP: Honestly, I don’t drink, I rarely go out so I never get ID'd. But being this tall, a lot of people figure out who I am pretty quickly. MD: How about the NYC Subway? Have you ever squeezed on? KP: Believe it or not, I’ve never been on the subway. MD: Good! Don't go down there. Alright, moving on to slightly more real questions, how long do you plan on wearing sleeves under your jersey? Would you ever go Full Melo? KP: Nah, never, that’s way too much sleeve. I’m actually dying to get rid of the undershirt but [the training staff] makes me wear it. This season, I’ll continue to wear it. MD: Has Phil Jackson ever given you a book? KP: Yeah, he gave me a book last year, and a little mini-book this year. He talks to us from time to time in a classroom, trying to get us to think more. MD: What are the books about? Do you remember the names? KP: Not off the top of my head, but they are mostly just about how to think and mindfulness and things like that. He likes to focus on the mental side and tries to get us to think differently. It’s really interesting. MD: He seems like a very serious guy. Have you ever made him laugh? KP: [Laughs] Probably, though I can’t remember, so I’m not sure. MD: Do you have a favorite NCAA team? Anyone you'll pull for in the tourney? KP: Nah, I don't really watch college ball. I'll watch some of the top guys that are coming into the league, but I haven't seen much this season. MD: What have you taught your Knicks teammates about Latvia? KP: Well, the first thing I had to do was teach them how to pronounce "Latvia." I'd get "LA-TIVIA" and "LA-TIVA" and all kinds of names. So that was first, but eventually they learned a lot about my country. A couple of the guys, including Kyle O'Quinn, Sasha Vujajic and (former Knick) Kevin Seraphin even came over there. MD: Finally, the most important question. I know James Dolan is a master of this instrument—but have you ever played the kazoo? KP: A kazoo? No, never. I don’t even know what it is.